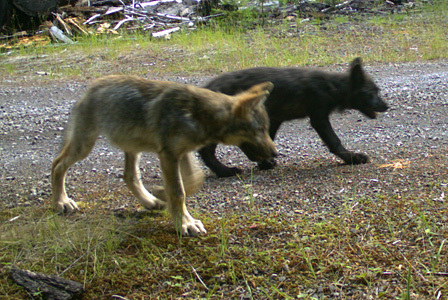 PORTLAND, Ore.— Wildlife officials today released photos confirming that Oregon wolf OR-7 has sired his third litter of pups since establishing the Rogue pack in 2014 in the Rogue-Siskiyou National Forest. Officials also have photo confirmation that in neighboring Lake County a pair of wolves known as the Silver Lake wolves has also produced pups. The Silver Lake wolves are a female wolf that dispersed westward from the Mount Emily pack and a male wolf, OR-3, that was born into the Imnaha pack and is OR-7’s brother. OR-3 and pup. Photos courtesy Oregon Department of Fish and Wildlife. OR-7, named by wildlife biologists because he was the seventh wolf captured and radio-collared in Oregon, established the first wolf pack in western Oregon in more than 60 years. Like OR-7, his brother, wolf OR-3, also dispersed from northeastern Oregon in 2011. But OR-3’s radio-collar stopped working and biologists feared he was dead. Then, last year, a trail camera in southwestern Oregon captured an image of OR-3 with his distinctive ear tags. He then met up with OR-28, the only radio-collared female wolf to have dispersed from northeastern Oregon to the other end of the state. The two were dubbed the Silver lake wolves. This is the first known litter of pups for 8-year-old OR-3. More wolves from northeastern Oregon have been gradually making their way into the southwestern part of the state. In addition to the Rogue pack and the Silver Lake wolves, two other radio-collared wolves born into the Imnaha pack, OR-25 and OR-33, have been ranging in southwestern Oregon, with OR-25 making occasional forays into California. 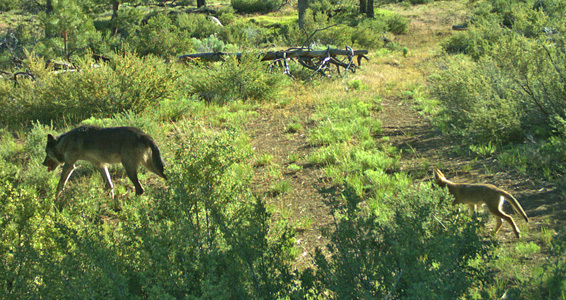 And two other uncollared wolves have been captured on trail camera in the Keno Wildlife Management Unit for the past several years. Wolves were once widely distributed throughout Oregon but were eradicated by a government-sponsored effort on behalf of livestock operators. In 1999 wolves from Idaho began to make their way into Oregon but the first several wolves that entered the state were returned to Idaho, struck by vehicles or illegally shot. It was not until 2008 that Oregon’s first pack was confirmed, and though Oregon’s wolf population has been increasing it is still significantly lower than what the state can support. A scientific analysis determined that Oregon can support as many as 1,400 wolves. Oregon wildlife officials have indicated that there are currently approximately 155 wolves in the state, and that wolves are occupying only a little more than 12 percent of suitable wolf habitat. Despite these low numbers and limited occupancy of habitat, last year the state stripped wolves from the state’s list of endangered species. The Center for Biological Diversity and two allies have filed a legal challenge to the delisting.